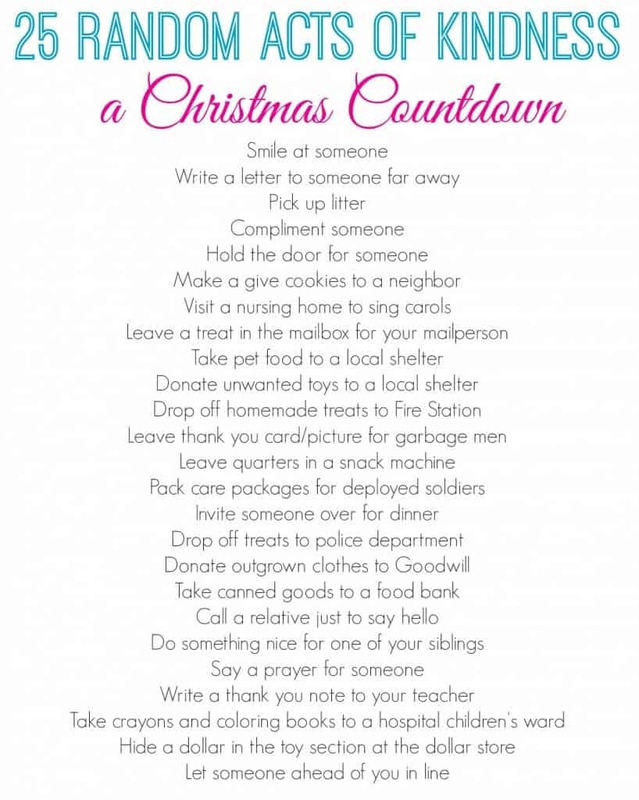 Celebrate the Christmas spirit with this free printable list of good deeds for a Christmas Random Acts of Kindness Countdown! I struggle a bit this time of year with how to teach my children the spirit of giving and kindness. I try extra hard to teach generosity this time of year because things can get very focused on “stuff.” We have always gone caroling-usually at nursing homes but last year we caroled for wounded soldiers with other military families. Last year each of my older boys (who were 4 and 5) packed a box for Operation Christmas Child. This year we bought presents for an Angel Tree for students from their school, which serves a lot of high need children. Three years ago I found a gorgeous mirrored Advent Calendar/Countdown Calendar at Target on clearance just after the holidays. 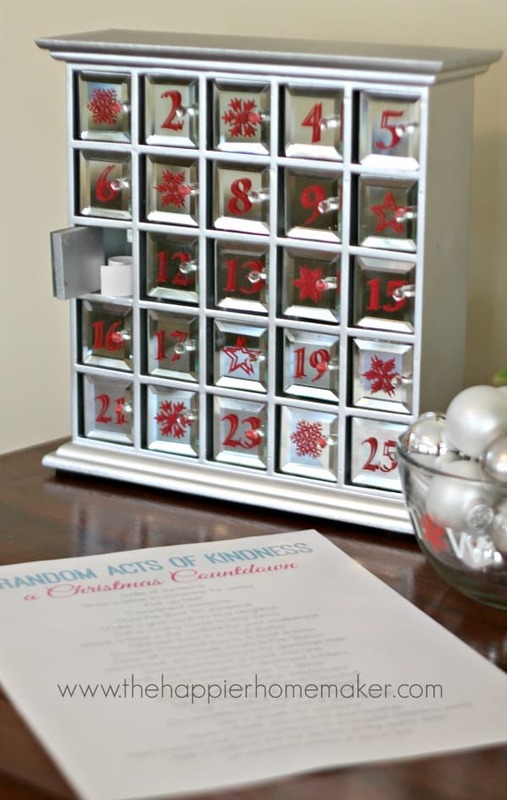 I knew I didn’t want to fill it with candy like the advent calendars I had as a child but instead use it to teach a lesson, so each year we’ve filled it with Christmas good deeds to do each day of December to help keep our hearts in the right place in the weeks leading up to Christmas. I created a free printable if you would like to join me in good deeds next month! Just click on the image above and you can download and print your own list. I cut my list into strips and roll them up and place on in each box but you could also put them in a jar or bucket if you don’t have a calendar similar to mine. For the updated printable click here to download. Will you be counting down to Christmas with good deeds and acts of kindness this year? I’d love to know how you try to keep kindness and generosity in your life this time of year. Thank you for this post. I am so inspired by it and think it is the perfect way to countdown to Christmas. Bravo, and much appreciated that you made it printer friendly. I am showing it to my kids this afternoon. Thanks so much for the sweet comment Lauren, you made my day! Have a great Thanksgiving!! This is such a beautiful idea, Melissa! Thanks so much Gwen! Have a great Thanksgiving!! 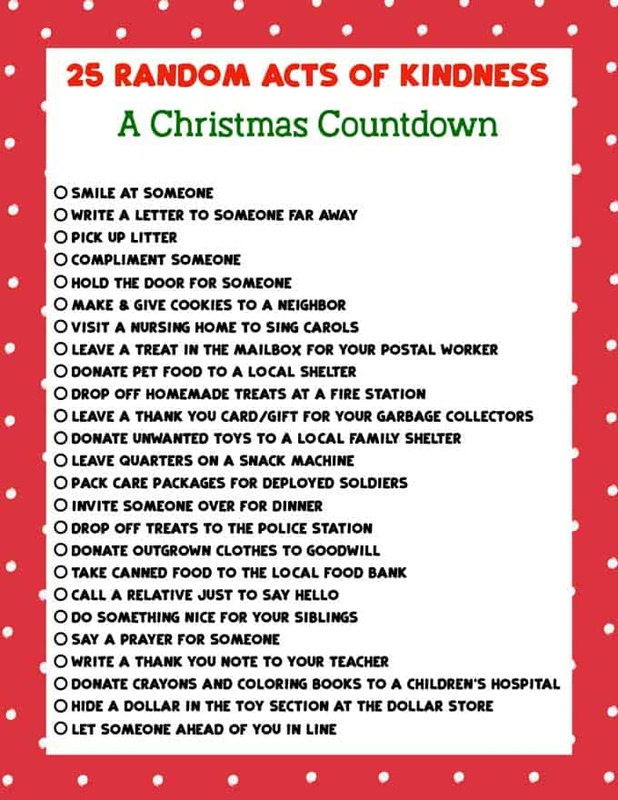 LOVE this Melissa – I pinned this to my RACK Pinterest board and will go over it with my boys so we can plan our random acts of kindness this Christmas! What a great Pinterest board idea Keri!! I’m off to check it out for new ideas! What a great way to count down the days until Christmas, love it! Pinning for sure! Thanks so much Jessi!! Have a great Thanksgiving!! I absolutely love this! We try to teach our daughter kindness and compassion. What a GREAT idea for the entire family to do! Thanks so much for the idea! I’m so glad you love it as much as we do Cindy!! Thanks so much for taking the time to leave a comment!! What a great idea! Definitely pinning this! Thanks Chelsea! Have a great weekend! SUCH a great way to approach advent! Thanks Amy, so far no pushback from the kids so it’s a winner in my book! I tried hard to distribute the good deeds mindfully through the calendar so school days were not time consuming, tasks coordinated with other events, etc. we did a calendar with similar ideas and passed them out at church. It was wonderful. Where did the beautiful box come from? Would love to have one. Hi Christi, I found the Avent Box at Target about 4 or 5 years ago, they usually have pretty ones each year!